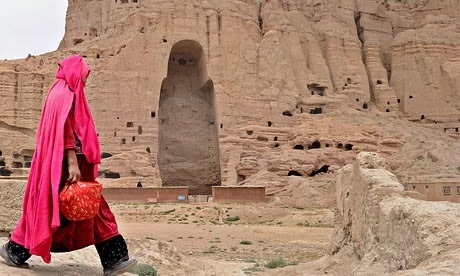 Any attempt to rebuild statues destroyed by Taliban could lead to the site losing its World Heritage status. Afghanistan has halted conservation work at a site once occupied by ancient Buddha statues destroyed by the Taliban because the team involved is suspected of secretly trying to rebuild one of the statue's feet, the United Nations said. Any attempt to rebuild the statues without official permission could lead to the site losing its World Heritage status. 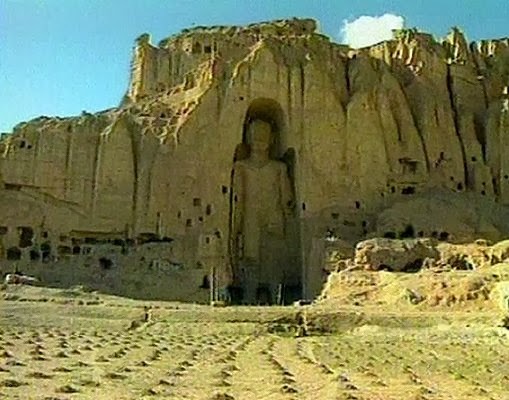 The Taliban's supreme leader, Mullah Mohammad Omar, decreed in early 2001 that two ancient giant Buddha statues in the valley in Bamiyan province were un-Islamic and ordered they be destroyed. They were blown up with dynamite the next month. The German wing of the International Council on Monuments and Sites (Icomos) had been working alongside the United Nations in the valley, aiming to reinforce the cliff into which the Buddha statues were carved. But the work was halted after a team from the UN cultural agency Unesco visited the site in December and found pillars built into the rock which looked suspiciously like feet, according to a Unesco official. "These pillars are the controversial issue ... Questions were raised concerning their design, that they resembled somehow the feet or the legs," said Unesco's Brendan Cassar. Cassar said the pillars were never meant to look like part of the original statue and his office was unaware of their design when the work started. "That should have been cleared not just by us, but the government and potentially the World Heritage Committee." The Ministry of Culture and Information has ordered that the work be stopped as recommended by Unesco. The Icomos office in Germany referred Reuters to a statement that said it had acted with the permission of the Afghan authorities for monument conservation. It also said its work had been stopped by Unesco's head in Kabul who had recommended that it be bulldozed. Icomos described this as "an insulting proposal for a brutal action, which would continue the destructive work of the Taliban". 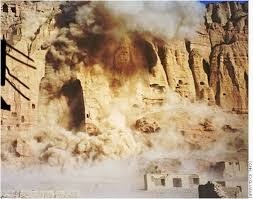 The destruction of the Bamiyan Buddhas in 2001 shocked the world and drew attention to the hardline rule of the Taliban. Six months later, the Taliban's al-Qaida allies launched the 11 September attacks on the United States. US-backed Afghan forces ousted the Taliban weeks later. Since then, there have been proposals for the statues to be rebuilt but the government has yet to settle on a plan. The government's director of historical monuments said he was in favour of rebuilding the statues if the World Heritage Committee (WHC) approved of a design. "The WHC has not approved but the government of Afghanistan has requested to rebuild the statue," the director, Abdul Ahad Abassi, told Reuters at his office in Kabul. "If the WHC accepts this request, then we will proceed." The controversial work had taken place over two weeks in an eastern niche, where the smaller, 38 metre (124 foot), statue once stood overlooking the valley. Its larger companion, to the west, towered 55 metres (180 feet) over the ancient Silk Route. Abassi said he hoped the statues could be rebuilt with old fragments. "We'll put the original pieces in their place and maybe use some fillings for those that have vanished."